US forces have started setting up the THAAD missile defense system in South Korea. It is supposed to intercept even long-range missiles. But how secure can such protection really be? When North Korea showed off huge trucks with containers carrying what looked like missiles at a military parade honoring late leader Kim il Sung on April 15th, observers could only speculate what was really inside the casings. But the show was impressive enough to make some believe the dictatorship possesses a considerable arsenal of not only medium-range but also intercontinental ballistic missiles. What's certain is that North Korea was able to launch a satellite into orbit in early 2016 and that it has repeatedly fired short- and medium-range missiles, once even from a submarine. It still remains unclear whether the country is able to fit a nuclear bomb into a war head that a missile can actually carry. But whatever the answer to that question may be - the threat is real. So, what can missile defense systems do to cope with the threat? 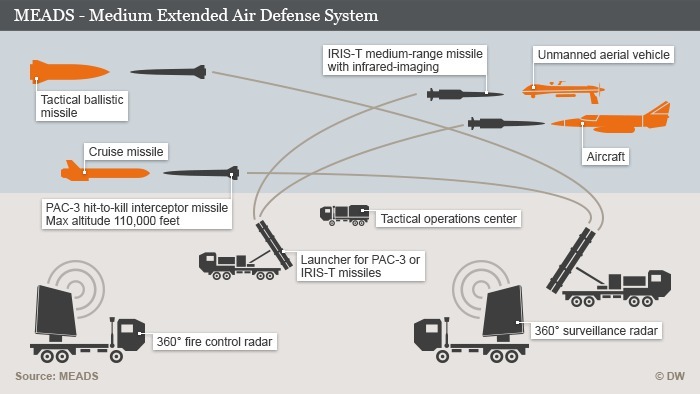 Missile defense systems, such as NATO's Patriot system, have in the past shown that they are relatively reliable in intercepting ballistic missiles. In the second Gulf War of 1991, the defense system was able to shoot down numerous Soviet-style Scud rockets, which the army of dictator Saddam Hussein fired against Saudi Arabia and Israel. However, there was a large number of missiles that still made it through. Reports about the success quota are differing greatly and rage from well under 40 percent to more than 80 percent of intercepted missiles. Scud missiles are considered short-range ballistic missiles with a range of 500 to 1,000 kilometers. The experience of the gulf war made Israel speed up work on its own comprehensive missile defense system consisting of several layers. Iron Dome is the centerpiece of the country's air defenses and can intercept even missiles with a much shorter range of only 5 to 70 kilometers. During the massive bombardment with missiles from Gaza between 2012 and 2014, the Iron Dome, according to the Israeli Defense Forces (IDF), managed to intercept 547 out of 2,968 missiles that were fired from Gaza into Israel. The Patriot system is able to also intercept medium-range missile, meaning those that cover distances from 800 to 5,500 kilometers. Other comparable systems include the European Medium Extended Air Defense System (MEADS), the IDF's Arrow or the Terminal High Altitude Area Defense (THAAD) which is currently being set up in South Korea. Furthermore, there is NATO's naval based Aegis Ballistic Missile Defense System. What all of those missile defense systems have in common is that they use highly precise ground-, sea- or air based radars, which identify the fired missiles and calculate their flight path accurately and in 3D. The computer is also able to detect which missiles actually pose a threat and which ones don't. Therefore, the systems can prioritize which of the missiles must be shot down and which can be ignored, like missiles that are going to land in uninhabited areas or at sea. If they find a missile that threatens a settlement or a city, they launch an interceptor missile. Older interceptors carry an explosive load that will explode when it gets close to the target and destroy the attacking missile. Such interceptors are mostly used to defend against short- and shorter medium-range missiles. Since the 2000s, western armies are increasingly using interceptors that do not carry an explosive load. Those are partly designed to intercept even long-range missiles. The THAAD system, which the US is currently installing in South Korea, uses such modern missiles exclusively. These so-called hit-to-kill vehicles are projectiles that are being carried into space by rockets. Ones the vehicles separate from the rockets, they go on a collision course with the target missile and to destroy it on impact. To make sure the hit-to-kill vehicles don't miss the target, they can course-correct via tiny engines located on all sides of the vehicle. Is it possible to intercept long-range missiles? There is practically no experience with intercepting medium-range and intercontinental missiles in a real war scenario. The reason is simple: these missiles are meant to deliver nuclear warheads and fortunately no country has tried that since World War II. In test-runs it proved possible, however, to hit and destroy medium range missiles in flight. Such missiles fly at a height of 150 kilometers - that means they're actually leaving Earth's atmosphere. Intercontinental ballistic missiles can reach heights of up to 400 kilometers. They travel at speeds higher than 3,000 kilometers per hour and can even reach more than 14,000 kilometers per hour. To hit such targets requires considerable precision. THAAD is reportedly able to hit some intercontinental missiles. But little is publicly known about possible tests. A huge challenge for engineers is the defense against multiple independently targetable reentry vehicles, where a missile releases a large number of nuclear bombs from one warhead outside the atmosphere. Each of them enters the atmosphere separately and hits its target. To defend against duch attacks, several companies are working to built interceptors with multiple kill vehicles. But it's not clear so far whether a design like that would work. It is clear, however, that the largest threat to missile defense is an overload of incoming firepower.